Kaylee Hurley is shown at the podium of the seated 400M at the State Track meet on Saturday where she finished as runner-up in all events. McClain’s Cody Hardesty rounds the corner of the second lap of his 800M run on Saturday where he finished 9th. Kaylee Hurley completes the first lap of her seated 800M on Saturday. Day two of the State Track meet on Saturday, June 6 saw McClain’s Kaylee Hurley and Cody Hardesty competing for a chance at a state title. 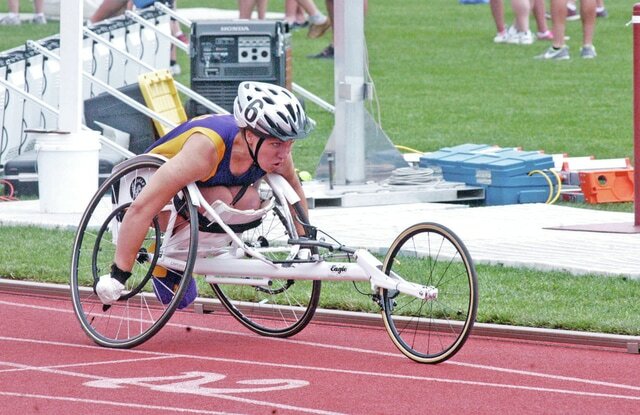 Starting off the day was Hurley in the seated 800M. In all her races on the day, Hurley was going up against not only the defending state champion in Jenna Fesemyer, but Fesemyer has also never lost a race in her high school career. In the 800M Hurley stayed right behind Fesemyer but was never able to overtake her and finished as the runner-up with a time of 3:03.47. In the second race of the day, Hurley state runner up again, this time in the 400M with a time of 1:14.36. At 2:30, Cody Hardesty was up, running in the 800M run. Hardesty finished 9th, which was unfortunately not well enough to get to the podium, with a time of 1:57.34. Hurley competed in her final race of the state meet at 4:40, the 100M dash, in which she missed getting a state championship by just one second. Hurley finished with a time of 21:59 right behind the champion who had a 20.51. Hurley will just be a junior next year and has two more years to make it to the top spot at the state track meet. With her times improving and the current state champion graduating, Hurley’s 2016 could be a promising one.